Made from 316 stainless steel, with oval stainless steel steps for comfort. Two fixing brackets each with two 6mm fixing holes, brackets can be removed from ladder for easy fitting. 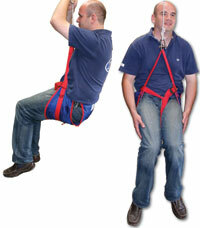 Extra brackets are available for fixing onto stand off to create a solid four point fixing. 7/8ins tube diameter. All ladders are 255mm wide with a stand off of 118mm. Made from 316 stainless steel, with Iroco (African Teak) steps for comfort. Four fixing brackets each with two 6mm fixing holes, brackets can be removed from ladder for easy fitting. Four point fixing as standard. This neat boarding ladder is 316 stainless steel easily extends to three or four steps and is ideal for small boats or for use on stern bathing platforms. It simply hinges up and folds flat when not in use. The specially designed steps have an extremely good grip and are also very comfortable when boarding with bare feet. A heavy stainless steel folding step for fitting to the transom to make it easier to climb out of the dinghy, fitted to the transom, mast or for interior use. A stainless steel spring holds the step in the closed or open position. 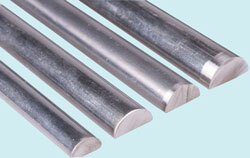 Made from stainless steel, folds flush when not in use. 2 x M8 fixing holes. Made from stainless steel. Folds away so neatly and easily you will hardly know it's there. 4 x M6 fixing holes. Made from black Nylon. 4 x m6 fixing holes. Wooden based bathing platforms with a 316 stainless steel frame, they have four rotating brackets to accomodate and angle of transom. Each bracket has two M6 fixing holes to ensure a stable and sturdy platform. 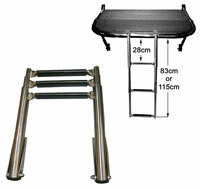 Platforms are available with supports mounted up or down, please select when ordering. 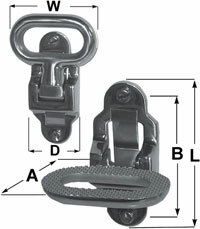 This neat aluminium boarding ladder hooks over the side of your boat and folds flat when not in use for easy storage.